**CALL FOR AVAILIBILITY 860-240-7406**, *BLUETOOTH*, *1 OWNER*, *MAZDA CERTIFIED*, *REAR VIEW CAMERA*. 2016 Mazda Mazda3 i Sport Liquid Silver Metallic CARFAX One-Owner. Clean CARFAX. Certified. FWD 6-Speed Automatic SKYACTIV®-G 2.0L 4-Cylinder DOHC 16V ACT NOW! OUR INVENTORY SELLS FAST DO NOT WAIT! 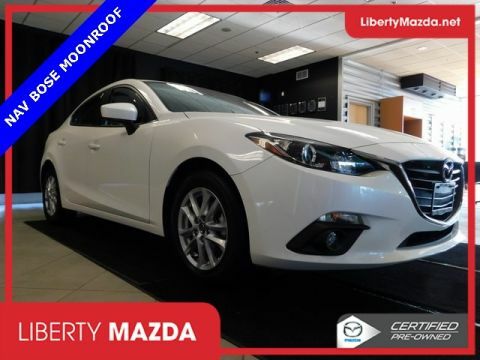 BUY WITH CONFIDENCE ONLY AT LIBERTY MAZDA! We offer Best Value Pricing - The easiest, informed way to buy a pre-owned vehicle. We researched similar vehicles within a 150 mile radius, and based on this vehicle's equipment, mileage and the current market conditions we give you the best value!